English translation of: Marc Debus, Politische Partizipation, in: Thomas Rahlf (Ed. ), Deutschland in Daten. 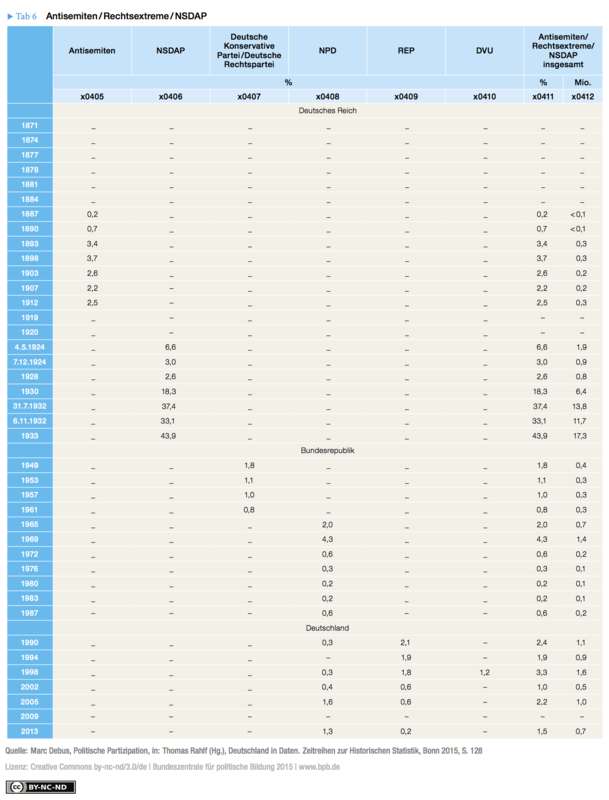 Zeitreihen zur Historischen Statistik, Bonn: Bundeszentrale für politische Bildung 2015, pp. 114-129. 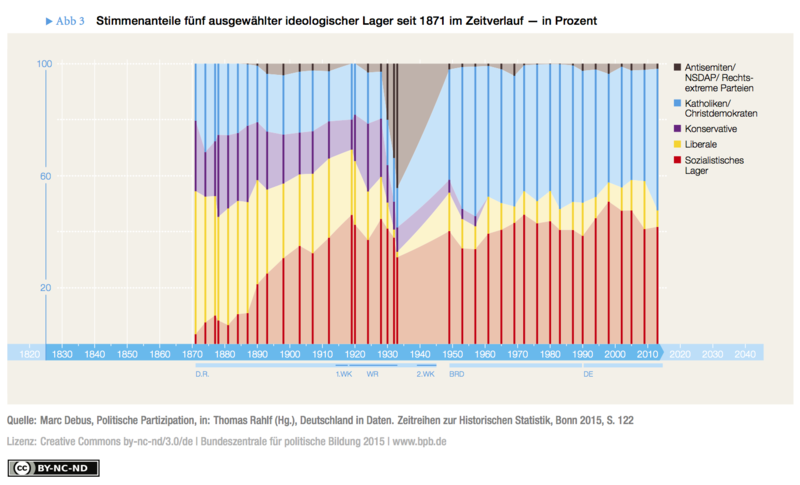 Marc Debus, Political participation: Eligible voters, turnout and election results in Germany, 1871-2013, in: www.deutschland-in-daten.de, 20.01.2016 < http://www.deutschland-in-daten.de/en/political-participation >. Democracy does not work without an adequate degree of political participation.1 The relevance of participation in the sense of an active citizen contributing to the political process is not new: in his famous „funeral oration“, Pericles already emphasised that it is not the silent, lethargic citizen who is essential for the survival and the success of a democratically organised state and its community, but the active one who is interfering into the matters of the state. Against the background of this assumption that is the basis of many recent democracy theories (for an overview see Schmidt 2010) and with regard to the institutional change that the nation states, which got established during the 19th century, experienced over time, it is necessary to have data at hand with which the degree of political participation in central institutions of modern democracy can be described and analysed. Such data can cover the size of the electorate compared to the total population, the turnout at the parliamentary and other elections and the strength of political parties on the basis of their election results. This article aims at presenting time series of central indicators of political participation in Germany since the 19th century and to interpret this data with regard to the institutional structure of the respective political system in Germany. The article starts with a short overview on the term “participation” in section two that discusses the different manifestations and relevance of the degree of participation for the trust into the respective political system and, therefore, for its stability and continuity. Section three presents selected time series that reflect the degree of political participation in Germany with a focus on the share of eligible voters with regard to its proportion to the overall population, the turnout at parliamentary elections at the national level and the election results of selected ideological “camps” since the establishment of Germany as a nation state in 1871. In addition, the presented data will be analysed depending on the development of the political system in Germany and its characteristics. Political participation has different manifestations and considerable consequences for the political process and its results in democratically organised states. Schultze (2011), for example, differentiates between (1) institutionalised, i.e. constitutionally provided, and non-institutionalised forms of participation, (2) directly and indirectly representative participation and (3) conventional and unconventional forms of participation in the political process. These differentiations can be easily illustrated by some examples. While in the Federal Republic of Germany the participation in an authorised demonstration is a form of a direct, conventional form of political participation legitimised by the constitution, the foundation of and the membership in a citizens’ initiative is an example for a direct, conventional form of participation that is not provided in the constitution. A house squatting or obstruction of railway lines would be a direct form which is not only not backed up by the constitution, but quite unconventional (Schultze 2011: 438). However, these three exemplary forms of political participation imply relatively high costs for the participating political actors with regard to the time invested into political action before, during and after the political engagement. In modern, representative democracies, the easiest way to participate in the political process is to take part in elections for public offices or parliaments when candidates belonging to different parties with different ideological positions are competing for the votes of the eligible voters of a country. This article will focus on how this relatively ‘cheap’ and conventional form of political participation provided by the constitution was developing in Germany over time and how institutional factors, particularly determined by the electoral system, have influenced the degree of political participation in Germany since 1871. Before doing so, we have to clarify why it is relevant to scrutinise scientifically the degree of political participation. According to the classical work of Easton (1965), the survival of a political system is considerably depending on the degree of political support of the citizens. Only if individuals trust the political system and support it, the institutions of a political system are able to stand up to the constantly changing external influence factors like international economic crises, foreign political conflicts or military confrontations. Therefore, democratic political systems and their institutions, which act on the macro-level, need – on the micro-level – citizens that actively take part in the political process by, e.g., participating in elections and referendums. This provides a legitimated basis for the political behaviour and decision-making of elected representatives (Putnam 2000; Gabriel and Kunz 2000; Freitag and Bühlmann 2005). A low turnout can result in negative consequences for the outcomes of the political process. If certain social groups are over- or underrepresented within the electorate, the elected representatives tend to formulate policies that are more suitable and favourable to those social groups that show higher participation rates. How can this mechanism be explained theoretically? If parties and their candidates pursue above all the goal of maximising their vote share and of ensuring their re-election (Downs 1957; Müller and Strøm 1999) and the voters base their voting decision on the promises of the parties and candidates as numerous studies prove empirically (for Germany see, e.g., Fuchs and Kühnel 1994; Roller 1998; Thurner 2000; Pappi and Brandenburg 2010; Debus 2010, 2012), political actors that compete for votes and act responsively by addressing the interests of the citizens have an important incentive to implement policies that favour those social groups that are more willing to participate politically (Powell 2004). This holds the risk of systematically ignoring the interests of parts of the electorate that are more likely to abstain from voting (Goerres 2007, 2008). For the results of the political process as government formation and decision-making within governments and parliaments, the turnout is not the only thing that matters, but also whether the different groups are equally participating in the elections for public offices. While there are numerous socio-economic factors like age, income, education, political interest and political attitudes, as well as the regional-familiar background and the respective “social capital” (cf. Verba and Nie, 1972; Verba et al. 1995; Putnam 2000; van Deth 2000) that influence individual behaviour, the electoral law is a central institutional factor that defines which parts of the population are entitled to participate in the political process in form of voting. Therefore, it is necessary to examine in a preceding step how large the part of eligible voters in relation to the total population is before scrutinising the turnout at the election for the Reichstag and Bundestag in Germany since 1871. Finally, the article analyses the vote shares of selected ideological “camps” in order to illustrate the largely high stability of voters’ ideological orientation over a period of nearly 130 years despite of a massive extension of the electorate. In the following, this contribution focuses on voting which is the form of political participation that is most common in modern representative democracies and least cost-intensive for the citizens. When scrutinising the turnout at the parliamentary elections on a national level in Germany since 1871, we figure out in a first step how large the share of the total population was that was entitled to participate in an election for the Reichstag (1871 to 1933) and the Bundestag, respectively. In a second step, we take a closer look at the expansion of the share of eligible voters that participated in a German national election in the course of time. Finally, we shed light on the development of the results of key ideological “camps” (Rohe 1992) composed by parties of similar ideological orientation and shaping Germany decisively since the end of the 19th century by controlling significant share of offices in parliament and the government. The share of eligible voters of a state shows how exclusive the right to vote is with regard to the number of people that are entitled to participate directly in the political process by selecting representatives and – albeit indirectly – in the modelling of political outcomes. Table 1 and Figure 1 show and illustrate the share of the inhabitants of Germany that were allowed to vote in the Reichstag and Bundestag elections since 1871. At the elections for the Reichstag during the German Empire from 1871 to 1912, only male German nationals older than 25 years were eligible if they were not placed under guardianship, were not in a state of bankruptcy and did not receive any welfare benefits so that the share of eligible voters only amounted to a fifth of the total population. After expanding the right to vote on female German nationals and reducing the electoral age to 20 years, the share increased clearly at the election for the Nationalversammlung (national assembly) in 1919, climbing to 58.5 percent.2 During the Weimar Republic, the share of eligible voters continued to rise, amounting to 68.4 percent at the elections for the Reichstag in November 1932, which can be explained by the fact that a high number of nationals born between 1900 and 1910 reached the voting age. At the election for the first Bundestag in 1949, the active voting age was raised to 21 so that the share of eligible voters fell to 63.4 percent in Western Germany. This value increased over time to more than 70 percent (at the Federal Election 2013, the share of eligible voters in relation to the total population amounted to 76.9 percent), which can be explained by the lowering of the voting age to 18 years since the Federal Election 1972 and the parallel increase of the life expectancy. The latter will lead to a continuing increase of the part of the population being of full legal age. In summary, it has to be noted that the share of citizens that are deprived from the right to vote and therefore from the basic form of political participation in modern democracies has significantly dropped from about 80 percent to 25 percent. Under the assumption that political parties and their representatives are eager to maximise their vote share, the political interests of a large part of the population must be addressed by the candidates for parliamentary mandates. However, a considerable part of the population, in particular children and adolescents as well as people without German nationality, has still no chance to participate at elections and therefore cannot delegate their political interests to political representatives, which has triggered a debate on reforms of the electoral law (Goerres and Tiemann 2009). Besides the share of eligible voters as regulated by the electoral law, another dimension for the patterns of political participation is the share of eligible voters really using their right to vote. Therefore, we want to take a closer look at the number of eligible voters participating in the political process and its development over time. It has to be noted that this value is not only influenced by the structure of the electoral law, but also by the values and attitudes of individuals who, depending on their personal background, have higher or lower chances to participate in elections for the Reichstag or Bundestag. Figure 2 shows the number of voters participating in the elections during the period of observation and their share in relation to all eligible voters. During the German Empire from 1871 to 1912, voter turnout increased considerably, climbing from 51 percent to 84.9 percent. In the Weimar Republic, the turnout started with dropping from 83 percent at the election for the Nationalversammlung to 75.6 at the election for the Reichstag in 1928. In the years of crisis that the first German democracy saw from 1929 on, the turnout at the elections for the Reichstag showed a clear upward trend, achieving an “all time high” of 88.8 percent at the last more or less free election for the Reichstag in March 1933. In the light of the good results reached at the elections for the Reichstag during this period by the parties KPD, DNVP and NSDAP being hostile to the parliamentary democracy, a high turnout does obviously not imply a high degree of satisfaction of the electorate with the political system and its basic principles as media reports often suggest after elections characterised by low turnout. At the first elections for the German Bundestag after the national socialistic dictatorship in September 1949, the turnout reached 78.5 percent and was therefore considerably lower compared to the participation rates in Reichstag elections in the early 1930s. During the 1950s, 1960s and especially the 1970s, the share of voters going to the ballots at Bundestag elections was significantly increasing, achieving the highest values of 91.1 percent and 90.6 percent in 1972 and 1976, respectively. In 1980 and 1983, the share of votes compared to the number of eligible voters was also very high, with 88.6 percent in 1980 and 89.1 percent three years later. 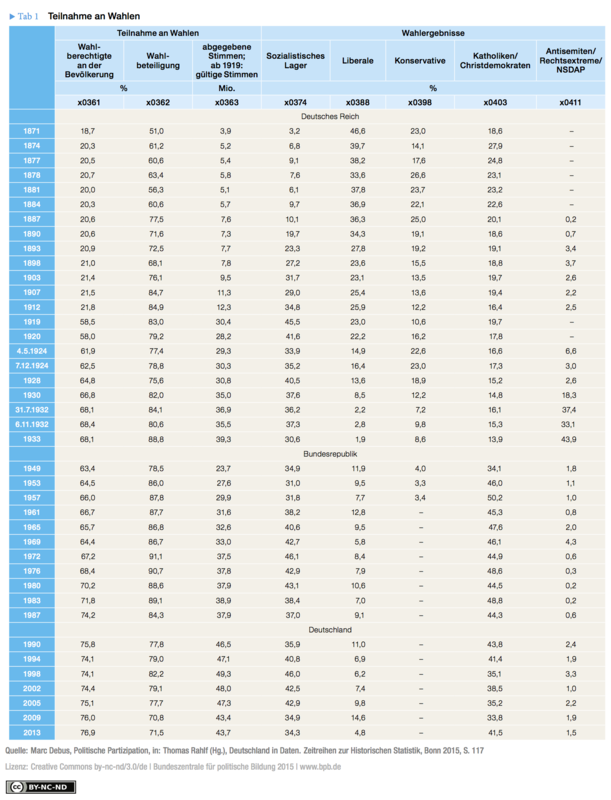 Since the Federal Election in 1987, the turnout is decreasing continuously (with exception of the elections in 1994, 1998 and 2013), reaching the bottom in 2009 with 70.8 percent; a look into the time series in Table 2 shows that this value was – with the exception of the 1898 election – only lower at the elections for the Reichstag in the time period between 1871 and 1884. Although high values of turnout do not necessarily imply a high satisfaction with and a high trust into the political system and its institutions as the examples of the elections for the Reichstag in 1930, 1932 and 1933 show, the historically extremely low value of 2009 catches our attention as it did not raise significantly in the Federal Elections of 2013 in which only 71.5 percent of eligible voters participated. Finally, we take a look at the development of the results achieved by the ideological camps at the elections for the Reichstag and Bundestag since 1912 in order to give information about the voters’ attitudes over time and answer the question whether the extension of the electoral law on female voters in 1919 and the lowering of the voting age in 1919 and 1972 had an impact on the strength of the parties that belong to the respective “camps”. 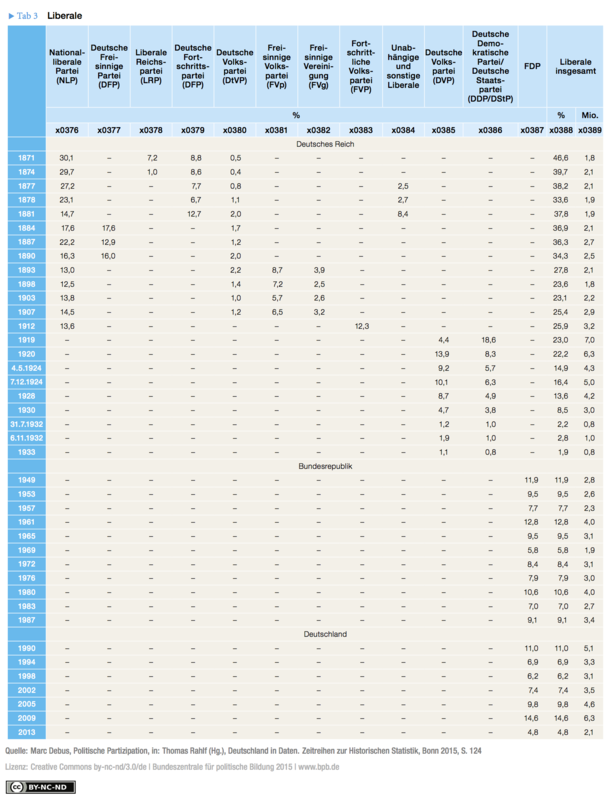 Tables 2 to 6 display the share of votes achieved by parties belonging to ideologically similarly orientated “party families” (Mair and Mudde 1998) or “camps” (Lösche 1994), as proposed by Rohe (1992). Let us have a look at the different camps: the “socialistic camp” includes the Social Democratic Party (SPD) and its predecessor Sozialistische Arbeiterpartei Deutschlands as well as the Unabhängige Sozialdemokratische Partei Deutschlands (USPD), the Kommunistische Partei (KPD/DKP), the Deutsche Friedensunion (DFU), the Partei des demokratischen Sozialismus (PDS) and the Linke. During the German Empire, the liberal camp encompasses the National Liberals, the Deutsche Freisinnige Partei, the Liberale Vereinigung and the Deutsche Fortschrittspartei while in the Weimar Republic the Deutsche Demokratische Partei (DDP) and its successor Deutsche Staatspartei (DStP) since 1930 as well as the Deutsche Volkspartei (DVP) were belonging to this camp; in 1949, the Free Democrats (FDP) is the party representing this camp. During the German Empire, the conservative camp was formed by the Deutsche Reichspartei and the Deutschkonservative Partei and in the Weimar Republic by the Deutschnationale Volkspartei (DNVP), the Deutsche Landvolk, the Deutsche Bauernpartei, the Landbund and Deutsch-Hannoversche Partei while the Deutsche Partei emerged after the Second World War and was mainly active in the northwestern part of Germany. The catholic or – since 1949 – Christian democratic camp comprised the Zentrumspartei and from 1919 to 1933 of the Zentrum and the Bayerische Volkspartei. Since 1949, this camp was formed by the Christlich Demokratische Union (CDU), the Christian Social Union (CSU) in Bavaria and the Zentrum. The right-wing extremist, anti-Semitic camp was represented during the German Empire by the Antisemiten, while the Weimar Republic knew the Nationalsozialistische Deutsche Arbeiterpartei (NSDAP) as a far right-wing party. Since 1949, the Deutsche Konservative Partei/Deutsche Rechtspartei (DKP/DRP), the Nationaldemokratische Partei Deutschlands (NPD), the Republikaner (REP) and the Deutsche Volksunion (DVU) emerged in this camp. Figure 3 shows the development of the vote shares of the different ideological camps over time from 1871 to 2013. The results show that during the Empire and therefore during the industrialisation process, the socialistic camp succeeded to gain an increasing support in the electorate so that the SPD could reach a share of nearly 35 percent at the elections for the Reichstag in 1912, although the growing strength of the Social Democrats was not adequately reflected by their parliamentary representation in the Reichstag. This is because the boundaries of the election districts were not redefined3 despite of large-scale migration movements into the conurbations and the increasing urbanisation between 1871 and 1912. Since the strongholds of the SPD were mainly in urban-industrial regions of the German Empire, the conservative parties that were dominant in the rural regions profited from the unchanged division into constituencies as an example of Lösche (1994: 43f.) shows: at the elections for the Reichstag in 1912, the rural district of Schaumburg-Lippe encompasses 12,000 voters while in the urban district of Teltow-Charlottenburg in Berlin, the MP had to represent nearly 300,000 voters. This connection is also illustrated by a closer look at the results in the constituencies of the German Empire at the elections for the Reichstag in 1898 when the Social Democrats could gain a vote share of 27.2 percent, but got only 56 seats in mostly urban constituencies while the Deutsch-Konservative Partei reached also 56 seats, but with a vote share of only 11.1 percent. At the elections in the Weimar Republic the socialistic camp, which was formed by SPD and Unabhängige Sozialdemokraten and then split up into SPD and KPD, achieved regularly more than 30 percent of votes. The support of the liberal camp eroded steadily between 1871 and 1933; this was also the case for the parties of the conservative camp (cf. Table 4). The support for the catholic Zentrum, however, remained almost unchanged. However, the centre party could not replicate its early successes of the 1870s and 1880s when it reached almost a quarter of the casted valid votes. It is striking that in 1919, the strength of the camps and the different parties did not change significantly despite of the massive extension of the eligibility, which suggests that the voting behaviour at the elections for the Reichstag was not strongly influenced by the gender of the voters nor the great change within the electorate between 1912 and 1919 (Rohe 1992: 123-125), so that particularly the attachment to social milieus seemed to be a stabilising and decisive factor determining the voting behaviour. However, this is not true for the parties of the right-wing anti-Semitic camp. During the Empire, the political forces of this ideological party family only succeeded to gain a maximum of 3.6 percent of valid votes; this situation did not change significantly when the NSDAP appeared on the stage: at the elections for the Reichstag in 1924 and 1928, the National Socialists only achieved a vote share between 2.6 and 6.6 percent. It was only at the elections for the Reichstag in June 1932, November 1932 and March 1933 when the NSDAP became the strongest party and gained a higher vote share than the parties of the socialistic camp. In the Federal Republic, the right-wing extremist parties together could not reach more than 5 percent of the votes at Bundestag elections; in 1969, however, the NPD nearly succeeded passing the five-percent threshold when gaining 4.3 percent of the casted valid votes. Since the federal election in 1990, the cumulated vote share of all running right-wing extremist parties was continuously slightly growing compared to the election results of the 1970s and 1980s, but the combined vote share of the right-wing extremist parties REP, DVU and NPD reached its maximum with 3.3 percent of the votes at the federal election in 1998. Because of the characteristic of CDU and CSU as a ‘catch all party’ that also integrated liberal and national-conservative segments of the electorate, the German party system saw considerable changes after 1945, which led to a weakening of the liberal camp and integrating the conservative camp into the Christian democratic one. Since the reunification in 1990, the supremacy of the Christian Democrats as the central actor of the German party system and of the ideological party competition got consolidated because of the political discord within the socialistic camp with the SPD confronting the PDS and its successor Die Linke (Debus 2011). Moreover, the emergence of the Greens (Bündnis 90/Die Grüne) as a stable part of the German party system and on the parliamentary level since the early 1980s further helped to stabilise the position of the Christian Democrats as the key actor in German party competition. An active, highly involved citizenry interested in the political process is essential for the stability of modern democracies. This contribution has demonstrated that the changes in the electoral law with lowering the electoral age and extending the right to vote on women led to an increase of the eligible part in the German population from almost 20 percent during the Empire and to about 75 percent in the Federal Republic. Under the assumption that the electoral law implies incentives for the parties and candidates competing for votes to concentrate on the interests of the eligible voters and therefore the danger of concentrating on the wishes of a minority among the population was banned over time. The development of turnout is not characterised by a steady increase, but rather by a slight “bell-shaped curve”: while the share of persons participating in elections for the Reichstag and Bundestag in relation to the total number of eligible voters was very high in the 1930s, 1960s, 1970s and early 1980s, it did not reach the records of about 90 percent at the first elections for the Reichstag in the 1870s and early 1880s, but also not since the 1990s. The future development will show whether this tendency is to continue or to turn around because of recently upcoming and highly conflictual issues like the financial crisis, the migration crisis or the consequences of climate change that concern large parts of the electorate. The strength of the ideological camps continued to be more or less stable despite of the significant extension of the electorate and the massive changes of the economic and social structure of Germany because of industrialisation, educational expansion and the economic trend towards a service society. The dissolution of the conservative camp and the weakening of the liberal camp can be explained by the characteristic of the Christian Democrats as a ‘catch all party’, which was able to win liberal and national-conservative voters across all social groups. Daniele Caramani (2000): Elections in Western Europe since 1815: Electoral Results by Constituencies. Houndmills: Palgrave Macmillan. Jan van Deth (Ed., 2004): Deutschland in Europa. Wiesbaden: VS Verlag für Sozialwissenschaften. Karl Rohe (1992): Wahlen und Wählertraditionen in Deutschland. Frankfurt am Main: Suhrkamp. Jürgen W. Falter (1991): Hitlers Wähler. München: Beck. Peter Lösche (1994): Kleine Geschichte der deutschen Parteien. Stuttgart: Kohlhammer. Hans Rattinger, Sigrid Roßteutscher, Rüdiger Schmitt-Beck, Bernhard Weßels et al. (2011): Zwischen Langeweile und Extremen: Die Bundestagswahl 2009. Baden-Baden: Nomos. Silke Keil and S. Isabell Thaidigsmann (Eds., 2013): Zivile Bürgergesellschaft und Demokratie: Aktuelle Ergebnisse der empirischen Politikforschung. Wiesbaden: Springer VS.
Rüdiger Schmitt-Beck (Ed., 2012): Wählen in Deutschland (Special issue 45 der Politischen Vierteljahres¬schrift). Baden-Baden: Nomos. Oskar Niedermayer (Ed., 2013): Handbuch Parteien¬forschung. Wiesbaden: Springer VS.
Bernhard Weßels, Hans Rattinger, Sigrid Roßteutscher, Rüdiger Schmitt-Beck (Ed., 2014): Voters on the Move or on the Run? Oxford: Oxford University Press. A historical analysis of selected aspects of political participation focusing on the share of eligible voters in relation to the total population, the share of actual voters in relation to all eligible voters and the share of casted valid votes achieved by central party political actors at elections on the national level, has not to be based only on official statistics, but also on existing scientific studies in this research field that have already collected data. 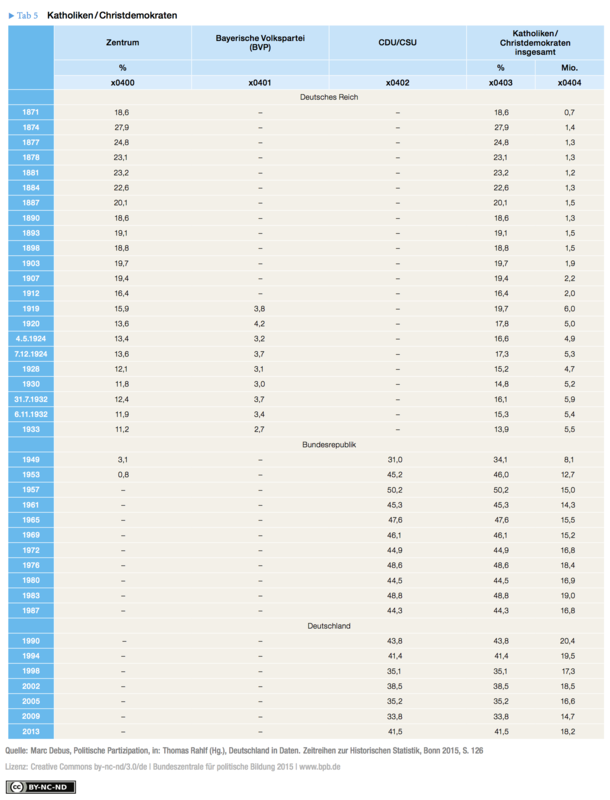 In order to get information on the population in Germany, the article has used the time series of Sensch (2004) for the period from 1871 to 1998, and the data of the Federal Statistical Office (available online at www.destatis.de) for the period since 2001. With regard to the German Empire from 1871 to 1918, the study of Gerhard Ritter and Merith Niehuss (1980) delivers data on the number of eligible voters and the number of citizens that actually participated in an election for the Reichstag or Bundestag as well as the number of votes and vote shares gained by the parties running at the elections. Falter, Lindenberger and Schumann (1986) have done pioneering work in collecting data on the elections and their results during the Weimar Republic from 1919 to 1933. 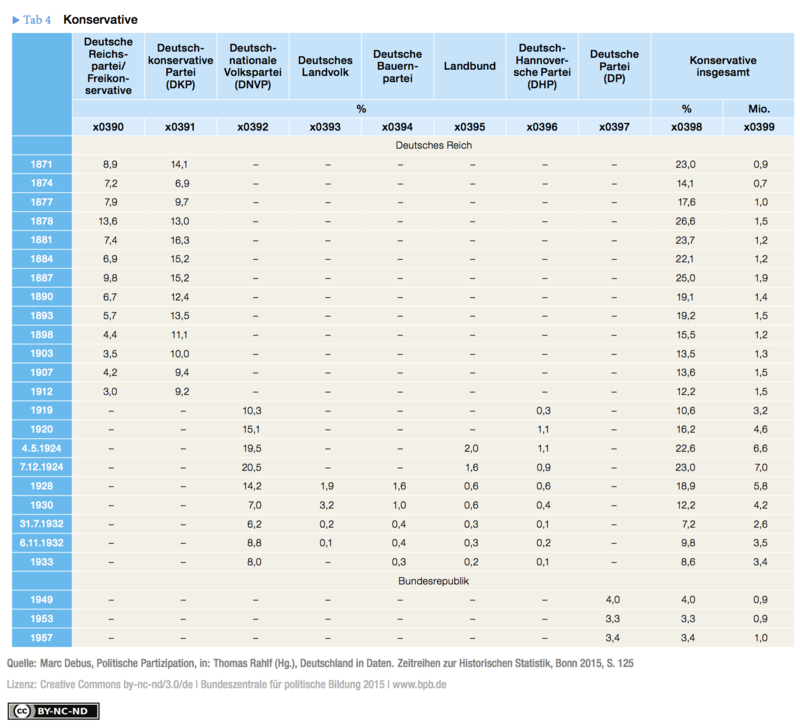 Concerning the period since the creation of the Federal Republic of Germany, detailed information on key figures of political participation is available with the Federal Returning Officer (www.bundeswahlleiter.de). Moreover, in the archive of GESIS, there are numerous election studies and survey data available that allow for a detailed analysis taking the individual level into account so that the reasons and backgrounds of political participation can be object of a more in-depth exploration. Debus, Marc (2010): Soziale Konfliktlinien und Wahlverhalten: Eine Analyse der Determinanten der Wahlabsicht bei Bundestagswahlen von 1969 bis 2009, Kölner Zeitschrift für Soziologie und Sozialpsychologie, 62(4), 731-749. Debus, Marc (2011): Parteienwettbewerb, Regierungsbildung und Ergebnisse der Koalitionsverhandlungen nach der Bundestagswahl 2009, in: Oskar Niedermayer (Ed. ): Die Parteien nach der Bundestagswahl 2009, Wiesbaden: VS Verlag. Debus, Marc (2012): Sozialstrukturelle und einstellungsbasierte Determinanten des Wahlverhaltens und ihr Einfluss bei den Bundestagswahlen im Zeitverlauf: Westdeutschland 1976-2009, in: Rüdiger Schmitt-Beck (Ed. ): Wählen in Deutschland, Baden-Baden: Nomos. Downs, Anthony (1957): An Economic Theory of Democracy, New York: Harper&Row. Easton, David (1965): A Systems Analysis of Political Life, New York: John Wiley. Freitag, Markus and Marc Bühlmann (2005): Politische Institutionen und die Entwicklung generalisierten Vertrauens, Politische Vierteljahresschrift, 46(4), 575-601. Fuchs, Dieter and Steffen Kühnel (1994): Wählen als rationales Handeln. Anmerkungen zum Nutzen des Rational-Choice-Ansatzes in der empirischen Wahlforschung, in: Hans-Dieter Klingemann and Max Kaase (Eds. ), Wahlen and Wähler. Analysen aus Anlass der Bundestagswahl 1990, Opladen: Westdeutscher Verlag. Gabriel, Oscar W. and Volker Kunz (2000): Soziale Integration and politische Partizipation. Das Konzept des Sozialkapitals – Ein brauchbarer Ansatz zur Erklärung politischer Partizipation?, in: Ulrich Druwe, Steffen Kühnel and Volker Kunz (Eds. ): Kontext, Akteur und strategische Interaktion. Untersuchungen zur Organisation politischen Handelns in modernen Gesellschaften, Opladen: Leske+Budrich. Goerres, Achim and Guido Tiemann (2009): Kinder an die Macht? Die politischen Konsequenzen der stellvertretenden Elternwahlrechts, Politische Vierteljahreschrift, 50(1), 50-74. Goerres, Achim (2007): Why Are Older People More Likely to Vote? The Impact of Ageing on Electoral Turnout across Europe, British Journal of Politics and International Relations, 9(1), 90-121. Goerres, Achim (2008): The Grey Vote. Determinants of Older Voters‘ Party Choice in Britain and West Germany, Electoral Studies, 27(2), 285-304. Lösche, Peter (1994): Kleine Geschichte der deutschen Parteien, Stuttgart: Verlag W. Kohlhammer. Mair, Peter and Cas Mudde (1998): The Party Family and Its Study, Annual Review of Political Science, 1(1), 211-229. Müller, Wolfgang C. and Kaare Strøm (1999): Political Parties and Hard Choices, in: Wolfgang C. Müller and Kaare Strøm (Eds. ): Policy, Office, or Votes? How Political Parties in Western Europe Make Hard Decisions, Cambridge: Cambridge University Press. Pappi, Franz Urban and Jens Brandenburg (2010): Sozialstrukturelle Interessenlagen und Parteipräferenz in Deutschland. Stabilität und Wandel seit 1980, Kölner Zeitschrift für Soziologie und Sozialpsychologie, 62(3), 459-483. Powell, G. Bingham (2004): The chain of responsiveness, Journal of Democracy, 15(1), 91-105. Putnam, Robert (2000): Bowling Alone. The Collapse and Revival of American Community, New York: Simon&Schuster. Rohe, Karl (1992): Wahlen und Wählertraditionen in Deutschland, Frankfurt am Main: Suhrkamp. 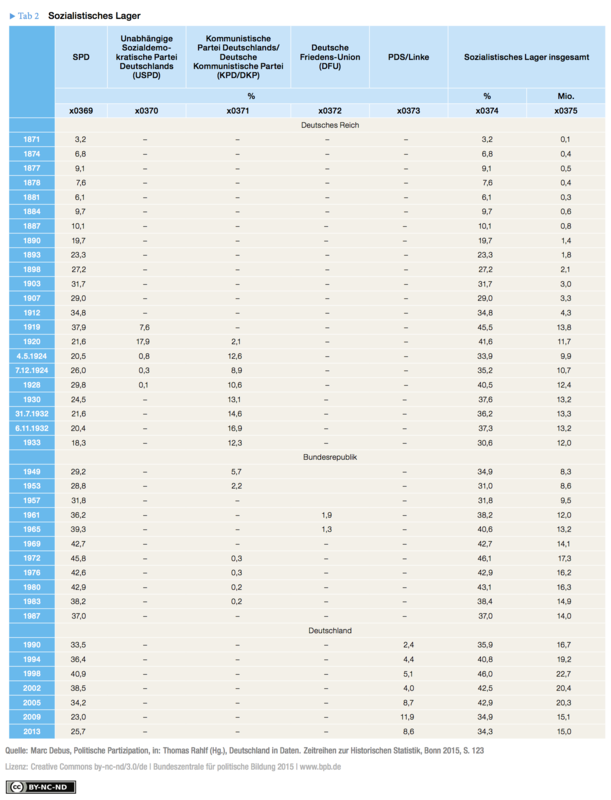 Roller, Edeltraud (1998): Positions- und performanzorientierte Sachfragenorientierungen und Wahlentscheidung. Eine theoretische Analyse aus Anlass der Bundestagswahl 1994, in: Max Kaase and Hans-Dieter Klingemann (Eds. ): Wahlen und Wähler. Analysen aus Anlass der Bundestagswahl 1994, Opladen: Westdeutscher Verlag. Schmidt, Manfred G. (2010): Demokratietheorien. Eine Einführung, Opladen: Leske+Budrich. Schultze, Rainer-Olaf (2011): Partizipation, in: Dieter Nohlen and Florian Grotz (Eds. ): Kleines Lexikon der Politik, München: Beck. Thurner, Paul W. (2000): The Empirical Application of the Spatial Theory of Voting in Multiparty Systems with Random Utility Models, Electoral Studies, 19(4), 493-517.
van Deth, Jan W. (2000): Interesting but Irrelevant. Social Capital and the Saliency of Politics in Western Europe, European Journal of Political Research, 37(2), 115-147. Verba, Sidney and Norman Nie (1972): Participation in America. Political Democracy and Social Equality, New York: Harper&Row. Verba, Sidney, Kay Schlozman and Henry Brady (1995): Voice and Equality. Civic Voluntarism in American Politics, Cambridge: Harvard University Press. I am indebted to Torben Schütz for his helpful assistance at collecting and analysing the data. In the Weimar Republic, disqualification from voting resulted from conviction to imprisonment and therefore loss of full rights as citizens as well as from being one of the 100,000 active soldiers of the German military (Reichswehr). The members of the Reichstag were elected in single-member constituencies with an absolute majority voting system. If none of the candidates could gain the majority of votes, a run-off took place with the two candidates that achieved most of the votes in the first ballot.